Sebastián… you may not recognize the name, but if you live in Texas, you probably already know a few of his works. There’s “La Antorcha de la Amistad” in San Antonio—a pair of vibrant red metal blocks that rush upward and then twist together at the top, situated along the Riverwalk at the traffic circle where Losoya, Commerce, Market, and Alamo streets converge. There’s “Monumento a la Mexicanidad,” or “La Equis,” in the north part of Ciudad Juárez (and hence visible from El Paso)—a huge red X with one jagged arm, and two circles jutting out from its black, eye-like central crossing point, situated at the Plaza de la Mexicanidad. And there’s “Aguacero,” also on the El Paso/Juarez border—the towering white gateway that looks like two geometric clouds, pouring rain; it’s right at the Paso Del Norte Port of Entry. These are just three of over two hundred large-scale metal sculptures by Sebastián located in cities throughout the world. He has many pieces in his native Mexico. For instance, there’s “Cabeza de Caballo” in Mexico City (fondly called “El Caballito de Sebastián”), and many monumental “doorways” or “gates,” like “La Gran Puerta de México” at Matamoros, Tamaulipas; “La Puerta de Monterrey” in Monterrey, Nuevo Leon; “La Puerta de Torreón” in Torreón, Coahuila; and “Puerta del Sol” in Ciudad Chihuahua. In Japan there is “Arc Fénix” in Sakai and “Tsuru” in Kadoma. And cities throughout Latin America such as Kingston, Buenos Aires, Havana, Montevideo, and Rio de Janeiro harbor his monumental works as well. Born Enrique Carbajal González in Santa Rosalia de Camargo, Chihuahua, Sebastián developed a love of both art and math early in life. 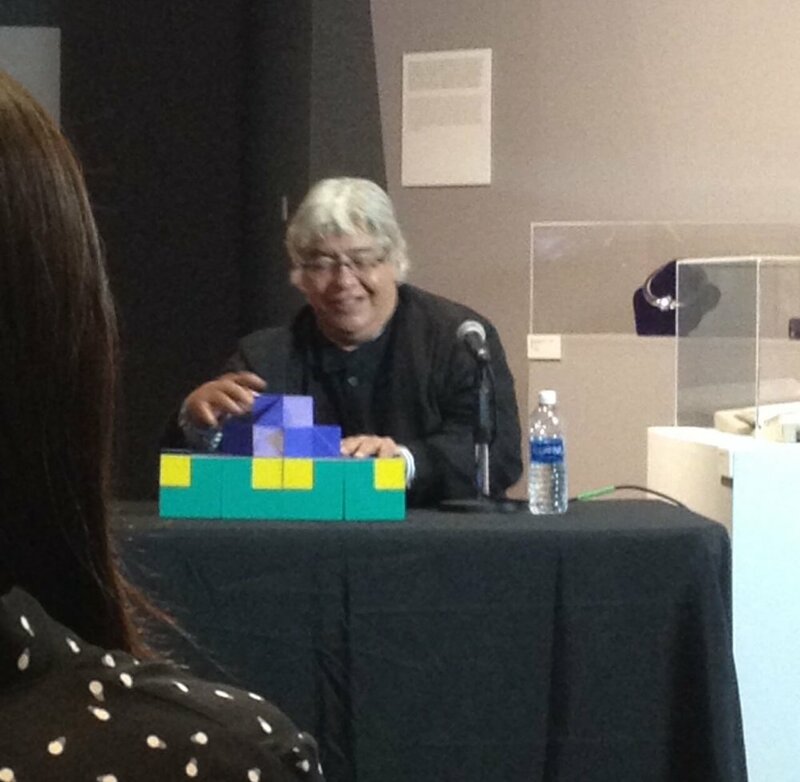 He went on to study art at San Carlos Academy in Mexico City, where he took on his pseudonym (from a nickname earned as a financially struggling student, referring to St. Sebastián) and began intertwining his interests in math and art in earnest, resulting in his earliest “Transformables” sculptures in the late 1960s. 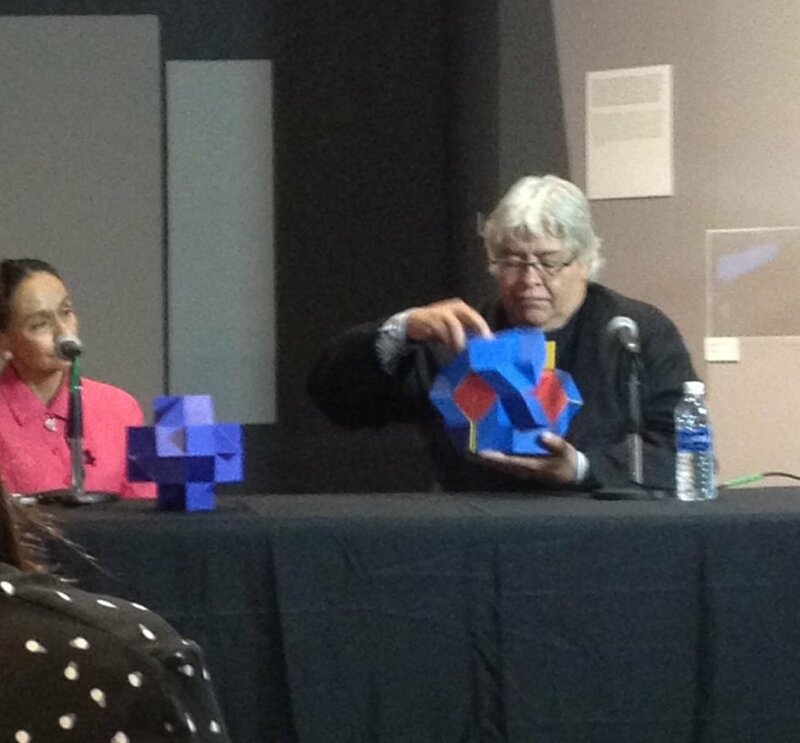 The “Transformables” began as small, colorful, and unfoldable geometric sculptures, made from thin cardboard. The series continued across decades to encompass metal and plastic manifestations. The early cardboard pieces are especially delightful in their saturated color palettes, and in their precision with an unusual material. The later plastic versions, while less visually striking in their surface textures and colors, make up for it in their kinetic abilities. Videos of Sebastián pulling and shifting the sculptures apart and into constituent shapes demonstrate an elegant fluidity of motion. Between these grand and small scale sculptures, Sebastián also has mid-sized work—drawings, digital images based on computer manipulations of forms, and mid-sized sculpture. The influence of geometry and attention to motion first demonstrated in his “Transformables” can be seen throughout the rest of his work. 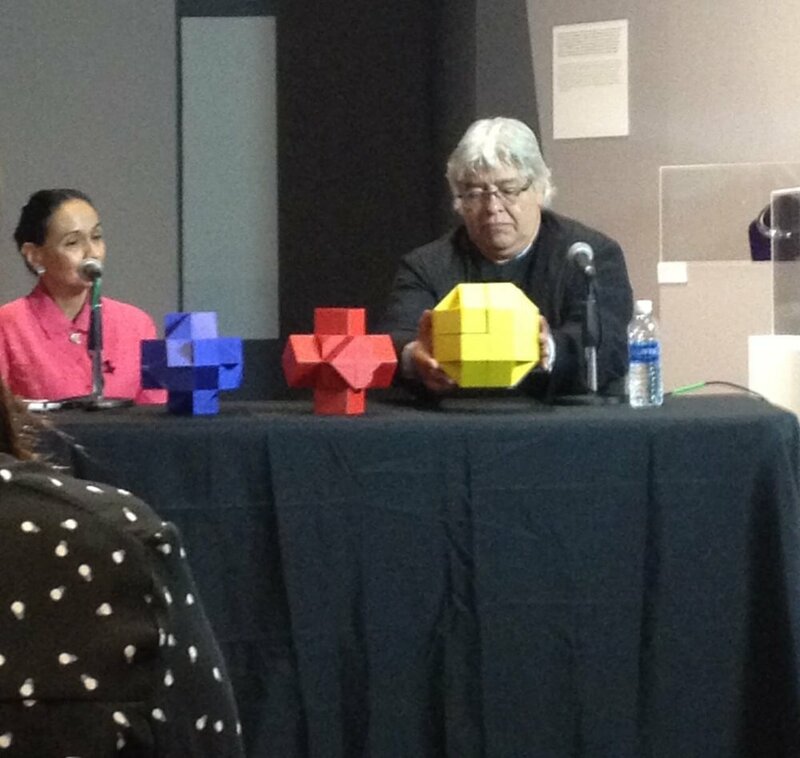 Sebastián has discussed geometry as a guiding philosophy, describing it as a beautiful and emotional body of knowledge. He also centers in his design the history and culture of the site for which he creates a sculpture. Hence, he has utilized Mexican indigenous and mestizx cultural concepts as aesthetic references in much of his work. Philosophical concepts like gateways as spaces of change and mediation, and aesthetic relations to Aztec, Mixtec, and Maya architecture, art, and literature, are present in his large works especially. The aforementioned “La Equis” for example, is a carefully engineered reference to Mexican indigenous and syncretic written histories. First, the Aztec and Mixtec day sign “movement,” “motion,” or “earthquake” is the shape of a thick X with a ball on either side of the cross point and an opening at the center—especially in the Mixtec way of writing. It is also the day sign at the center of the Sun Stone, or Aztec calendar stone, combined with the face of sun god Tonatiuh, referring to the fifth sun, and fifth manifestation of the world. Another aspect of the letter x’s connection to Mexican history is about visual representation of phonetics. As scholar Elizabeth Hill Boone describes it, Aztec and Mixtec writing “is pictographic rather than glottographic,” meaning the visuals are not made to correspond to the sounds of the word, but rather to the concepts, and can be orally read in different languages. Phonetic writing of Nahuatl (which Aztecs spoke) in alphabetic script began during colonial times. The sound “sh” is a significant phonetic component of Nahuatl and other indigenous languages of the region, and came to be alphabetically transcribed with “x,” as in “Mixtec” and “Mexica,” so those cultural names are related to the letter as well. In addition, there is a reference to the “x” specifically in the name “México.” “Mexico” comes from Nahuatl “Mexica,” which refers to the specific cultural group that began the Aztec empire. Spanish orthography was the framework used by Spaniards and indigenous people of what is now Mexico to make alphabetic writing of Nahuatl and other languages of the region—Antonio de Nebrija’s Castillian grammar especially. There have actually been several variations in the sounds that “x” refers to in that theory of phonetics, so this story may not be literal, but there is a story about the spelling of the name that has come to be tied to celebrating indigenous cultures of Mexico. Benito Juárez, the first president of Mexico with indigenous heritage, and from whom Ciudad Juárez takes its name, is sometimes said to have officially changed the “j” in “Mejico” to “x,” to speak to the more Nahuatl-esque letter choice, and to the crossing of indigenous and Spanish cultures in Mexico that the arms of the X could represent. The implied concept of only two intersecting cultures here should be acknowledged as omitting important complexities; there are more than two cultures which intermingle in Mexican history, as there are not only Spanish and indigeno cultures—there are people of a variety of African civilizations’ heritages, as well as many different indigenous civilizations’ heritages; we can also interpret the concept of crossing to be more expansive than just binary, however. As is common for large scale public art, there have been critiques of the use of resources which Sebastián’s vast sculptures represent. The decolonial currents in his work are exciting to many, offering visibility to often marginalized concepts, and celebrating regional aesthetic histories. However, in our economic system, money put toward public art can understandably feel like a lost potential for already all too absent social services, or a lost opportunity for funding of local artists’ work. Plus, due to scale and materials, often the only forces who could commission a Sebastián monument are governments or business associations. “La Antorcha de la Amistad,” for instance, was commissioned by AEM, Asociación de Empresarios Mexicanos, a U.S.-based organization started by Mexican-American business people to support business interaction between the U.S. and Mexico. It’s certainly true that Sebastián’s work is bound up in corporate power, but so are practically all other edifices being constructed in our time period. His pieces represent interesting interventions in this field. You can see a selection of Sebastián’s work in Austin, Texas from April 8, 2017 through June 25, 2017 at Mexic-Arte Museum’s exhibition “Sebastián: The Geometry of Space and Time.